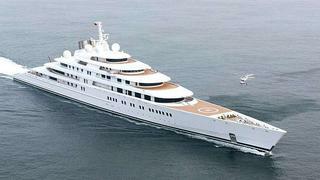 Lürssen has officially announced that the largest superyacht in the world – 180m Azzam – has completed her sea trials in the North Sea. Azzam was launched in April 2013, and she has completed a few rounds of sea trials – exceeding 30 knots, her predicted top speed. Official performance stats from Lürssen to come. The super-sized superyacht is powered by four engines (two diesels and two gas turbines), linked to water-jets, producing 94,000hp. The interior design, which includes an open-plan main salon measuring 29m by 18m, is by Christophe Leoni. The decor is inspired by early 19th Century French Empire design. Engineer Mubarak Saad al Ahbabi assembled and guided the build team, which in addition to Nauta and Christophe Leoni, included technical project management by Burgess and technical engineering by Lürssen.